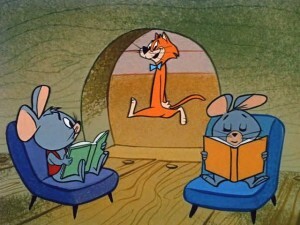 Like Mr. Jinks “I hate those meeces to pieces”. 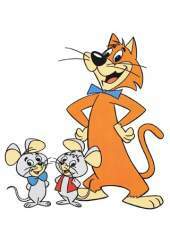 Mr. Jinks was talking about Pixie and Dixie, whereas I think my troubles were caused by wood mice (see photo on the right below). I checked some colonies last weekend and one of the nucs was suspiciously quiet. Upon further inspection it was clear that a family of mice had taken up residence and destroyed the colony. This is my first winter loss to rodents since I started beekeeping … and it’s my own fault. 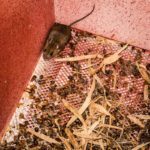 My standard, so-called ‘kewl’, floors are mouse resistant – they have an L-shaped entrance tunnel that is too narrow for a mouse to get through. I’ve used these for several years and, consequently, pretty much ignored the need for mouseguards. I’ve also overwintered many poly nucs over the last few seasons and never had an issue with rodents. Maybe I’ve just been lucky. Whatever the reason, the combination of no previous problems coupled with misplacing lots of my little-used (“When did I buy that?” and “I never knew I owned one of those”) beekeeping paraphernalia during the move to Scotland meant that I didn’t put mouseguards on any of the Everynuc poly nucs in my apiaries. These nucs have a cavernous entrance, just about the only poor design feature of these hives in my opinion. I sublimated these colonies with oxalic acid (OA) on the 9th of December and had checked the removable tray a few days later … there were few if any mites, but also very little hive detritus (legs, cappings, pollen etc.). However, it was a filthy wet day (again) and I didn’t have a veil or gloves with me so left them to it. 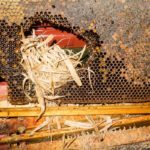 I suspect the mice moved in shortly after the nuc was treated with OA (or they’re a lot less affected by vaporised OA than beekeepers are), leaving them nearly three weeks to wreak carnage in, what was, a very strong nuc. I’ve now found the mouseguards and fitted them to the remaining nucs … better late than never. 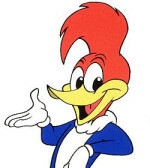 While we’re on the subject of hives receiving unwanted attention in the winter it’s worth remembering Woody Woodpecker. Green woodpeckers – these, not the greater or lesser spotted woodpeckers, are the ones to be concerned about – are scarce and locally distributed in Scotland, though they are spreading slowly North-East according to the British Trust for Ornithology. I’ve yet to see one in Fife. I’ve therefore not bothered wrapping my colonies in damp proof membrane or taken more drastic measures with yards of chicken wire and bamboo canes. Woodpeckers generally only damage hives when the weather is really cold, conditions we have yet to experience this winter. I’m also told it’s learned behaviour and, as green woodpeckers are usually resident, some apiaries can experience problems while others, just a few miles away, escape unscathed. 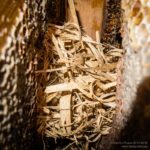 If they are about and they have learned what easy-pickings are available in a hive you’d be advised to protect them – a woodpecker can quickly get through a cedar hive and usually targets the handholds of poly hives (often the thinnest part of the sidewall) though these are easy to repair. This entry was posted in Beekeeping, Rodents and tagged Dixie, Jerry, mice, mouseguard, Pixie, winter, woodpecker, woodpeckers on January 8, 2016 by David. Almost certainly a pregnant female mouse that entered after the vapour had gone. If it had been present when you gassed/sublimated the colony the mouse would have died immediately. I did a chemistry degree in the distant past. The toxicity of most chemicals is pretty similar for all mammals. The beauty of oxalic sublimation over dribbling is that the active ingredient, an organic acid, penetrates the wax cell containing the larvae and condenses on the outer structures of the larvae and it’s mites, disrupting the life cycle of the mite and having an acceptable effect on the larvae. My gut feeling is that no larvae who have had oxalic acid on their outer membranes would ever be selected by the colony to develop into a queen. The disadvantages of oxalic sublimation is the PPE (you should use) and precautions the beekeeper has to use. For me it’s a no-brainer, sublimate rather than dribble. Do you have a reference of any kind to the “penetrates the wax cell” for OA vapour? 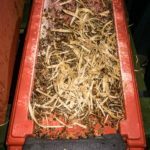 The dogma is that sealed brood is unaffected and that’s whey treatment needs to be during a broodless period (midwinter) or repeated multiple times at a set interval during the season. I’ve done both and can certainly vouch for the convenience and efficiency. It would be easy to test whether larvae exposed to OA vapour would be selected (by the colony) for generating queens … perhaps that’s something to do once the season kicks off? Ouch! That’s a real shame. It is easy to get lulled into a false sense of security, isn’t it? I haven’t yet had a problem with mice (I do put mouse-guards over my National hive entrances every year in November, before it gets cold and in time for the flying bees to get used to the strange holes at the entrance when they come out for the odd flight in the winter), but have been a bit blase about woodpecker protection. Your post has reminded me (in time) to think about it. I live near a copse and although a large number of the trees have been felled by the guy who bought the plot as a building plot for his mansion (he works in the financial sector) there are probably still woodpeckers in there – there certainly used to be as we could hear them. Previous years I hung plastic around the hives, but haven’t bothered this year. Time to think again! Perhaps your local woodies haven’t learned to rob hives? It’s only really an issue once the temperature gets very low anyway. The only time I’ve had a hive attacked is during a prolonged cold snap when one made short work of the only bit of exposed woodwork visible below the damp proof membrane (https://www.theapiarist.org/woodpeckers/) I’d pinned on to protect the hive … in this case it was only the sidewall of the floor that was trashed. Other colonies as little as 3 miles away were never targeted, despite there being a large number of green woodpeckers about. Why am I not surprised the term ‘mansion’ and ‘financial sector’ appeared in the same sentence? Not really trying to defend mousy – albeit very cute…..but say you’d incinerated the queen whilst doing the OA treatment (ie bad luck) – then wouldn’t you be faced with the situation you found, with a very healthy looking rodent? If I put my fist in the hive, I would not expect the bees to abscond – so why would a normal colony not drive the mouse away? It is not yet cool enough for them to be clustering. It’s possible the queen failed or was toasted, though I’d be surprised if it was the latter … my vaporiser squirts the vapour into the colony from outside and I suspect the temperature is rather cool. If this was the case I’d have probably seen high levels of attrition in workers when treating earlier in the season (which I haven’t). So, I don’t know what happened, other than there were bees present on the 9th, and they’d gone and been replaced with a family of mice (the photo was the only one who didn’t take a flying leap out of the entrance into the bushes). It’s certainly cool enough for them to have been clustered up here … we’ve already had enough snow for tobogganing and several days with frost. Mean temperatures for December were a little above 5C, a full 4C less than in the balmy Midlands. Nice to see your blog, is that the title?, all new to me so i am now about to sign up. Thanks to Liz for the link.